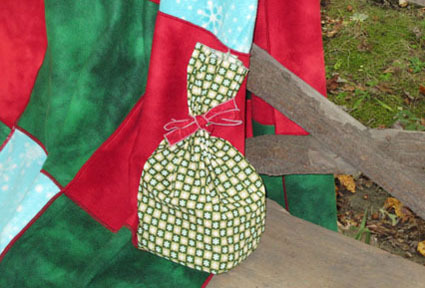 The Fat Quarter Gifts Bags I featured in my Holiday Serging webinar are a great way to use some of your fabric stash, and they’re eco-friendly! I made about two dozen bags this year from holiday fat quarters — some to wrap gifts for friends and family, and twelve for the women at Room in the Inn here in Buncombe County, NC. Room at the Inn is a program that provides accommodations for homeless women as they transition from homelessness to having permanent homes. They’ll be at St. Mary’s all week, from Sunday afternoon until late Christmas morning, and I wanted to be sure they had a happy holiday. We’ll be decorating a Christmas tree, making cookies, getting hair and nails done, and watching lots of holiday movies. For Christmas Eve we’ve filled the bags with all sorts of things: hand-knit scarves, soaps & shampoos, gift cards, nail polish, socks, bus passes, journals, pens & pencils, calendars, candy & gum, toothbrushes & toothpaste, small hand-tatted snowflake ornaments, and more. You’d be surprised how many things can be stuffed into just one bag! Here they are — twelve filled gift bags, ready to be delivered on Christmas Eve. (Notice how they’re cozying up to my serger!) They’re super simple to make — 15 minutes, tops — and each fat quarter makes a bag and a fabric tie. For my Fat Quarter Gift Bags instructions see my Just Sew It! handouts at berninausa.com > Classes > Just Sew It! For more information about Room in the Inn and to find a program in your area, google Room in the Inn Homeless and the name of your town, city, or county.